Easy to use honey pot. Dipper is attached to the wooden handled lid. Clear glass, and easy to clean. Glass pot is approximately 3 inches diameter and total height 4 1/2 inches. Holds about 8oz honey. It looks and works great! Very pretty sitting on my counter and as long as I clean around the rim each time I use it, it's been great. I love this little honey pot! I ordered four of them (3 as gifts). I’m very pleased with the quality and customer service. Don’t wait! Order one now ?? 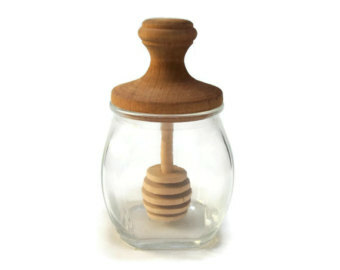 Love the honey pot- not only is it adorable but it works great too! How Well Are You Willing to Bee?